Plus, this month’s Literary Junkies Link Up after the review! While it took me a bit of time to connect with this book, once I did, it was unforgettable. “As dawn approaches in New York, literary agent Isabel Reed is turning the final pages of a mysterious, anonymous manuscript, racing through the explosive revelations about powerful people, as well as long-hidden secrets about her own past. In Copenhagen, veteran CIA operative Hayden Gray, determined that this sweeping story be buried, is suddenly staring down the barrel of an unexpected gun. And in Zurich, the author himself is hiding in a shadowy expat life, trying to atone for a lifetime’s worth of lies and betrayals with publication of The Accident, while always looking over his shoulder. “The Accident” is not only the title of this book, but it is the title of the book within the book; a book written about a media corporation and the scandals behind its founder. The author of the manuscript wants to expose these scandals (well, some of them) and so he sends his book to someone he knows will understand. However, there are plenty of other people who don’t want those scandals revealed, and what follows is a thrilling chase, endangering everyone who finds themselves with a copy of the book. The characters are interconnected and I was able to figure out who the main character really was before I was specifically told, which in a way was fulfilling. 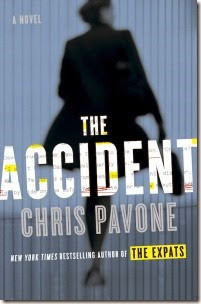 A well-written book, The Accident kept me interested and engaged as the story went on. I loved that it took place over one crazy and exciting day. I would be happy to read more about these characters! While this genre is not my regular pick, I am happy that I got to read and experience this book. I am currently reading Black Chalk by Christopher Yates in preparation for my review on April 4! I suppose it was The Babysitters Club. Either that or Sweet Valley Twins! The Help, to remind us of the not so distant past, The Hunger Games, to show us how we shouldn’t create our future, and The Time Traveler’s Wife because it’s still my favorite book. General fiction; nothing too literary, just a good story that’s engaging and easy to get into. Whatever I pull out of the box!